Okay, so a “media blitz” might be over-doing it, but I sure felt like a celebrity! A couple of weeks ago, the editor of our newspaper called me saying she’d read my blog, loved it and wanted to do an interview for a weekly column featuring locals. I struggled with my nerves but said, “yes, I would love to do it.” I even took it a step further and suggested she join me for lunch after the interview so we could taste the recipe. Now, I’m not a person that’s usually in the newspaper so I fretted over what to cook, what to say, what to wear . . . ridiculous how many things I found to stress over! In the end, I found Jasmine to be a very friendly, outgoing person and we had a very pleasant afternoon of cooking, interviewing, photographing and best of all – eating. To make things interesting, I made a never-before-tried Thai soup that I’d been hungry for since I started seeing these packages at Costco. As often is the case, I found 3 or 4 recipes to compare and combine. I ended up slightly adapting a super easy recipe I found on Tastebook. 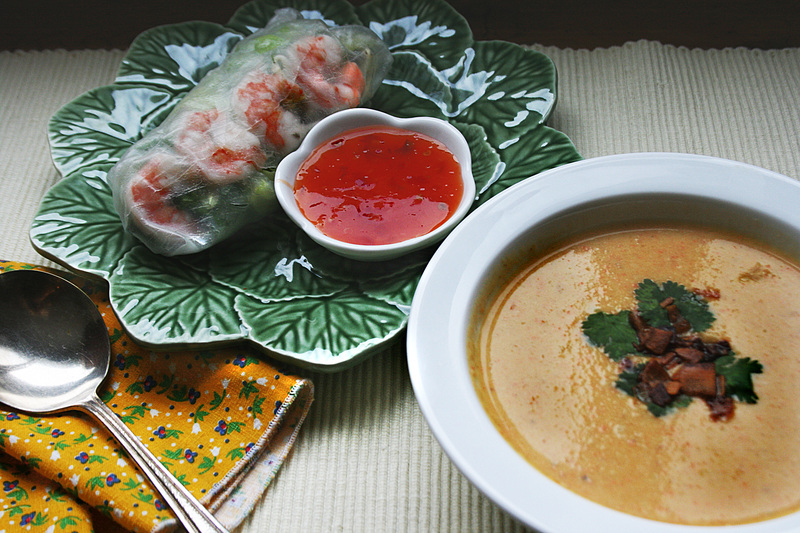 I made some fresh, healthy spring rolls ahead of time to go with this delicious soup. It’s been a couple of years since I’ve made spring rolls, but it came back to me as I worked. 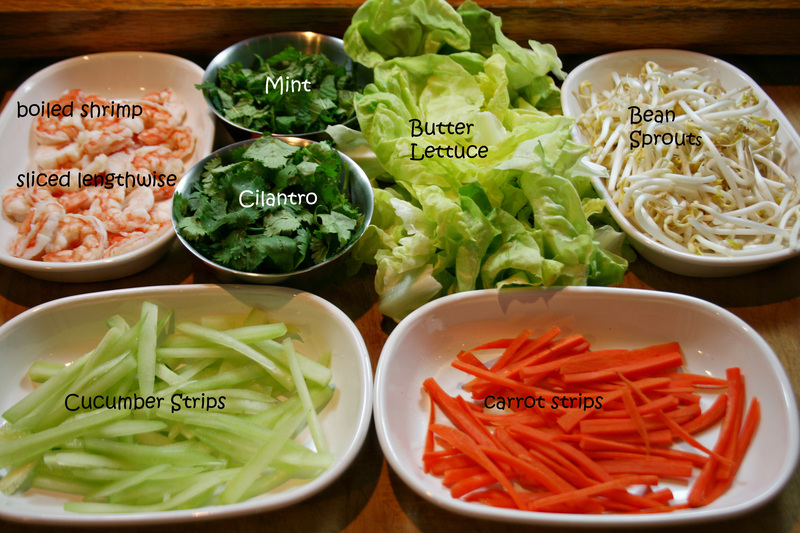 All you need are spring roll wrappers and a nice combination of super fresh ingredients cut into bite-sized pieces. I used these – but pick your favorites! To make the rolls simply soak the wrapper in very warm water for about 30-60 seconds until it’s soft and pliable – the wrapper continues to soften as you work and needs to be handled delicately. Place the wrapper on a flat surface such as a dinner plate. Arrange a short row of ingredients near the bottom of the wrapper. I placed four pink shrimp in a neat row, then arranged cilantro leaves all around forming a colorful outside layer – pretty when rolled up! Stack the desired ingredients on top of the shrimp and carefully fold the bottom of the wrapper up and over; fold the sides in, then roll the wrapper around the ingredients. Finish by gently pressing the wrapper down until the roll sticks together before placing it on a serving plate. Continue until you have the desired amount – two apiece is enough for a lunch side-dish. Cover the dish with plastic wrap and refrigerate until time to serve. Side with your favorite dipping sauce – I used a spicy sweet Thai chili sauce. Our lunch plates looked pretty tasty . . . turns out, the soup was terrific! Preheat the oven to 375 °. Place cubes in a large glass baking dish with a 1/3 cup of water. Cover with foil and bake until tender – mine cooked 50 minutes. 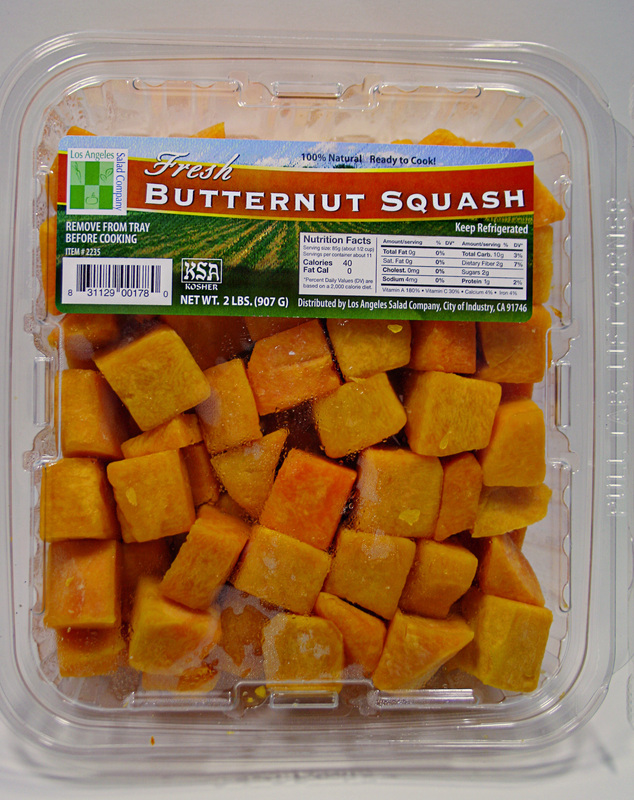 If using a whole squash, halve it lengthwise, scoop out the seeds, place face down in a baking dish with a little water, cover and roast until tender – scoop the meat into a bowl after it cools. Heat oil in stock pot over medium heat. When hot, add cumin and sauté until fragrant. Increase heat to medium-high, add onions, garlic, carrots, celery, seasonings. Cook until vegetables soften. Stir in chicken stock, peanut butter and cooked squash. Simmer 5 to 10 minutes; taste for seasoning and adjust if necessary. Reduce heat and slowly add coconut milk while stirring. In my humble opinion, the spring rolls were a great side for this soup. Every year when we get that first hard frost, I go out and pick the garden clean. The results are a little overwhelming and we do our best to eat, give away, can or dry the bounty. 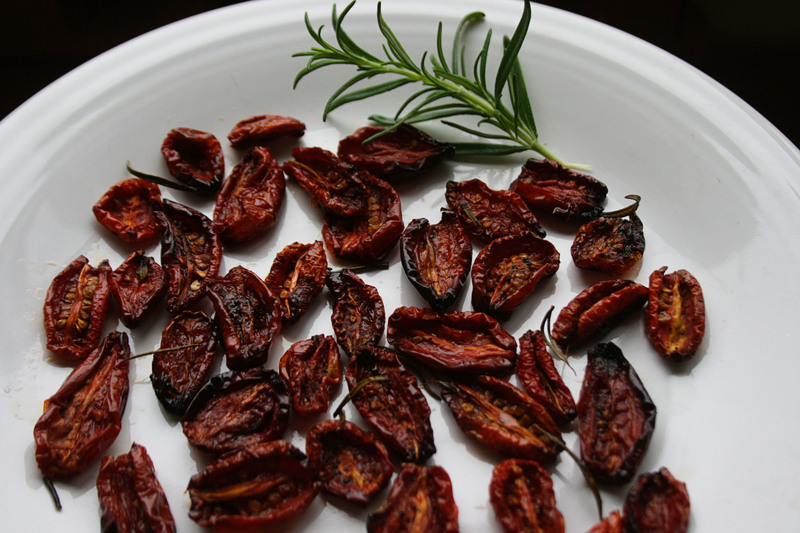 When Karen from “Karen Cooks” posted these delightful little jewels, I looked at my counter FULL of ripening tomatoes and broke out in a huge grin. I couldn’t wait to try her recipe and ended up serving them to some good friends who came over to help fold origami for a project. They were perfect with little toasts, slices of dry salami, thin slices of aged Romano cheese and wine (or beer). Hands down, this is one of the most perfect ways I’ve ever found to use up some of that end-of-season, giant heap of tomatoes. It’s simple and delicious which is a perfect combination, don’t you think? The first batch went away so fast, I had to make another. 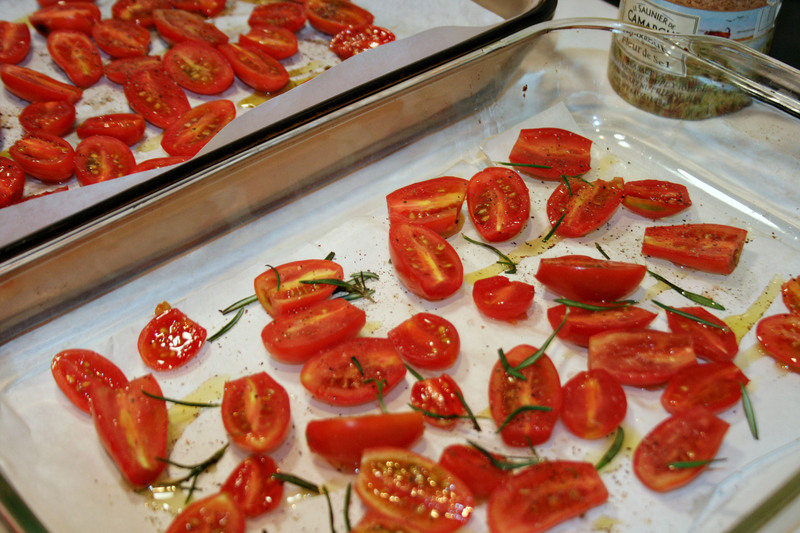 This time I made two pans and added rosemary leaves to one of them. I’m also swimming in herbs, so everything but oatmeal gets an herb garnish. The prep was easy. My little Juliette tomatoes are pretty small, so I sliced the ends off and halved them lengthwise. Next I laid them in a baking dish on parchment paper, cut side up. To finish, I drizzled a little olive oil over them, added a sprinkle of sea salt, fresh ground pepper and some (optional) fresh rosemary. Bake them at 300º for about 3 hours. Check them and, if necessary, cook them a little longer until they’ve lost their juiciness. The ones that were still a little juicy were delicious, too, though the chewy ones were my favorites. Seriously, this is like a plate of grown-up candy. I love to add a good recipe to my database. Thank you, Karen; this is one of the best finds ever! Chili was the first dish I ever loved enough to create on my own. My mom didn’t make it very often, but they served it at school with those crazy good cinnamon rolls and it was my absolute favorite meal from the cafeteria. When I was 13 or 14, I decided it was something I could surely figure out. My dad helped me with the shopping and I set to work figuring the ingredients and quantities. When I think back on it, it makes me smile. He was my guinea pig and ate it like a champ. It must have tasted good enough to inspire me to keep trying. It’s still a quest. Yesterday I made a big batch of my favorite “Texas” chili. At the last minute, I remembered reading about cumin polenta somewhere, but where?? I tore through several cookbooks and my database before deciding it was in a magazine somewhere – lost for all eternity. 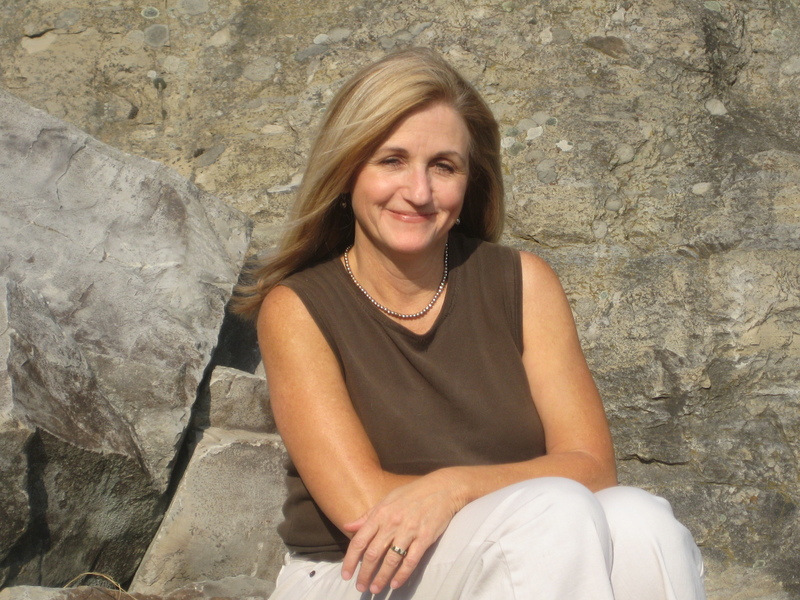 So I faked it – and it was fabulous! I have a feeling this will be the requested side from here on out. It was such a great combo! My chili varies, but here’s what I used for this delicious batch. salt & pepper at the end to taste. Garnish as desired. Some of my favorites: cilantro, raw onion, cheddar cheese, olives, avocado, black olives, sour cream, chopped hot pepper, bacon bits, fresh tomato, etc. etc. To prepare, simply saute the meat, onion & garlic. Add the canned ingredients and seasonings – bring to a boil then simmer for 2-3 hours. I use a cover and remove it near the end to thicken up the chili if necessary. Also, sample the seasoning after it’s been simmering for at least on hour and tweak if necessary. When the chili was almost ready, I chopped up some garnishes then started the polenta. Combine the stock and the cumin in a large saucepan on medium-high heat. When it boils, reduce the heat to low; very gradually whisk in the cornmeal. Cook, stirring constantly, until it starts to thicken. This took around 5 minutes. Stir in butter and milk. Salt to taste. To serve, spoon a generous amount of polenta in the bottom of a flat bowl, using the spoon to make an indentation in the center. Ladle chili over the top and garnish as desired. Call the troops and wait for the nods of approval. This is sooo good! 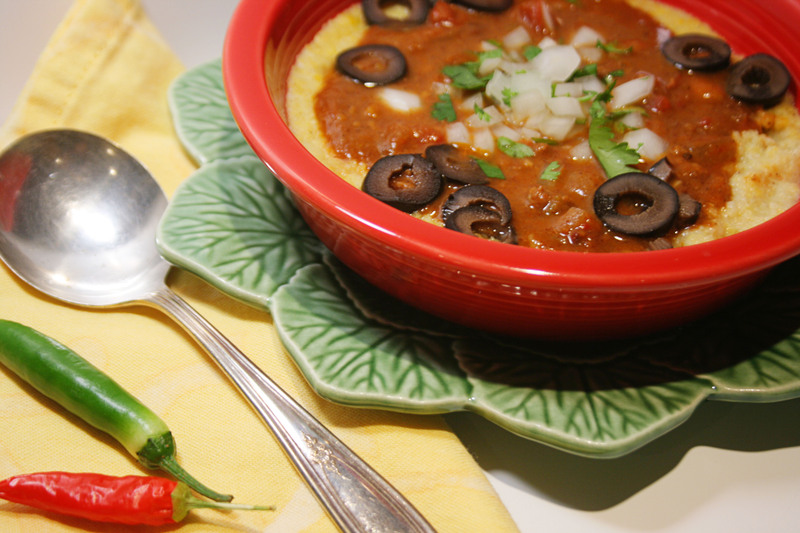 Try it with your favorite chili recipe. Your email address is private and you can unsubscribe any old time you want - I won't judge. Easy Way To Peel Gar… on Le Creuset for Christmas!